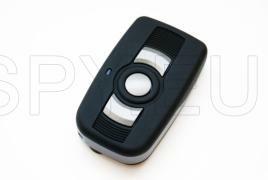 This is a small camera hidden in the remote control. With it you can record audio-video files in AVI file format in resolution 720x480 or individual images in JPEG format in resolution 1280x960 pixels. 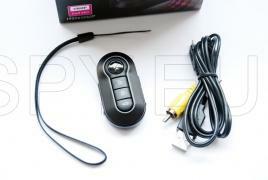 Footage is recorded on a MicroSD card (which is not included in the package). The device supports cards with capacities from 1GB to 16 GB. 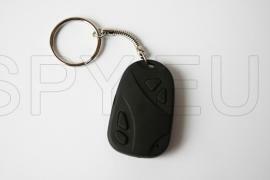 In the keyring there is a built in rechargeable lithium-ion battery that allows continuous operation time of about 1 hour. Time to recharge the battery is about 3-4h. The remote can capture audio-video files with resolution 1920x1080, takes pictures with resolution 4032x3024 and it can also record audio files. 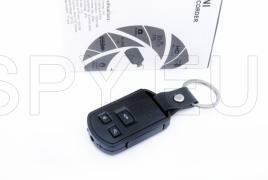 Its software has a motion detector which starts video recording when it detects motion before the lens. 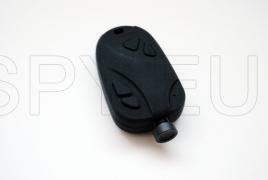 To be able to capture images in complete darkness the remotte is equipped with infrared LEDs.